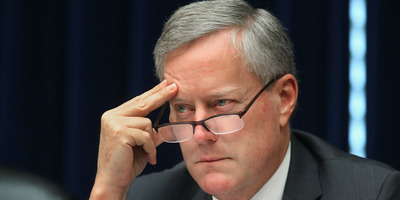 Chip Somodevilla/Getty ImagesNorth Carolina Rep. Mark Meadows. Conservatives are once again livid at the last-minute government-funding bill, which they say will not include significant wins for their side. House and Senate leaders are finishing up a plan before funding runs out at midnight Friday. WASHINGTON – Another government-funding deadline, another collective groan from the far-right conservatives in Congress. Those on the fringes are feeling angry and dissatisfied with the latest effort by House and Senate leaders across both parties to cut a deal and secure enough votes for a bill that will be taken up in a short few days. “The leverage of conservatives on this particular initiative has been minimal and we have tried to negotiate around the edges, but frankly, they only go to Democrats for the majority of the votes,” said North Carolina Rep. Mark Meadows, who chairs the influential House Freedom Caucus. Many members of Congress have not even seen pieces of the text of the $US1.3 trillion spending bill, which is said to include a handful of provisions tacked on, like the “Fix NICS” bill to bolster the National Instant Criminal Background Check System and funding for the Hudson River Gateway Project. “Your Republic might have serious issues if elected Congressmen must scour twitter feeds of reporters covering leaks from anonymous senate staffers to know what’s going to be in the 1,000-page bill they will be asked to vote on in 24 hours,” Kentucky Rep. Thomas Massie wrote on Twitter on Wednesday afternoon. The omnibus spending package is also not going far enough to address border-security provisions that conservatives want, like funding for a wall along the US-Mexico border. Coupled with the spending projects elsewhere, many conservatives were enraged on Wednesday afternoon as the bill was being finalised. “I would just say Planned Parenthood gets money, the unconstitutional NICS program gets money, the Gateway Project gets money, the American taxpayer gets a trillion dollar deficit and no money for the wall,” said Ohio Rep. Jim Jordan, himself a former chairman of the Freedom Caucus. The inclusion of the “Fix NICS” bill, which incentivizes government agencies and states to update the background-check system, is a particular sore spot for conservatives. The House passed the bill last year, but it was paired with a bill granting concealed-carry reciprocity across state lines, a plan that was a key objective of the National Rifle Association and deemed a nonstarter in the Senate. “I think if I told you of promises broken, this would be a tremendous one and a very clear one,” said Ohio Rep. Warren Davidson. Unlike Jordan, who called the background-check system “unconstitutional,” Florida Republican Matt Gaetz said that Republicans largely expected the bill to make its way back to the House without any concealed-carry-reciprocity component. But 40 House Republicans signed on to a letter authored by North Carolina Rep. Ted Budd promising to oppose any Fix NICS bill that came back from the Senate without an attached concealed-carry provision. Whether or not that pledge holds in the face of a third government shutdown in as many months is unclear. But many of the conservative members are already firmly against the bill that has yet to be made public.